The Bronx is another cocktail with an interesting history, which shows in the fact that I have two recipes for it. This is kin to the Manhattan, in that it is another New York City borough name, and is in the same family of liquor and vermouth drinks. (And, yes, there is another borough cocktail, the Brooklyn, and I hear internet rumors that there is one for Queens, which is a Bronx with pineapple juice instead.) There are two stories about how it came to be. Either way, this cocktail was created back in the first few years of the 1900s—a good 30 years before our reference books were written. The first attributes it to Joseph S. Sormani, and only uses Italian vermouth. 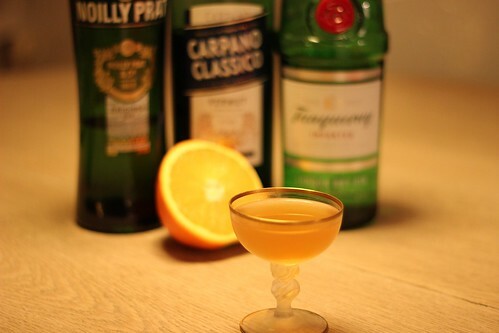 The second story states Johnnie Solon as the creator, and uses both Italian and French vermouth. You can get the details in the Wikipedia article. One interesting thing to note is that in the original story recipes, there are no bitters, so the Lommebogen recipe added that in. This is the recipe that is still used in modern recipes. I really like both of these cocktails. They are very easy drinkers with the orange juice in there. Overall the Lommebogen recipe is sweeter, with the higher amount of orange juice and all sweet vermouth, but I don’t find it cloyingly sweet at all, and I think the addition of the bitters helps balance it to some degree. I think a lot of my friends, who aren’t as into “boozy” drinks as I am, would prefer Lommebogen, while as a rule, I’d probably drink the modern version. Frankly I’d take either version and be happy.